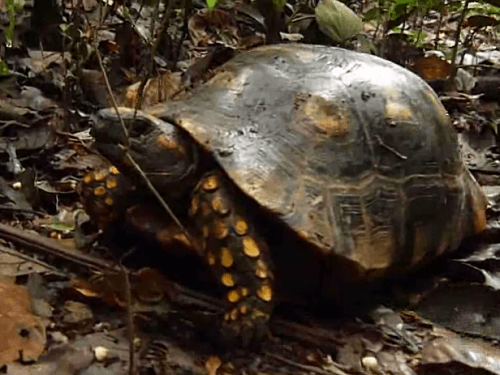 This is a species of tortoise that is very closely related to the Red Footed Tortoise. It is naturally found in the Amazon Basin in South America. It is the third largest mainland tortoise with an average length of 15.75 in. (40 cm). Its carapace is yellowish to dark brown in color. Some are black at the edges of the carapace. The head of the yellow footed tortoise is small and longer than it is wide. The skin on the head and limbs is black in color and has scales whose color varies from yellow to orange. The forelimbs have 5 claws and are long and flattened. Adult males tend to be larger than the females. These tortoises exist in a variety of habitats. There have been many disagreements in the past over the habitats that they prefer. Some people say that they have preference for dry forest areas and grasslands. Others say that they prefer humid forests. However, studies have shown that they like to live in grasslands, drier forest areas, savanna, and rainforest belts. They are omnivorous. These tortoises eat many different types of foliage. Their diet consist of grasses, carrion, fallen fruits, plans, bones, mushrooms, excrement, plants and slow moving invertebrates such as worms and snails. They are too slow to be able to capture any fast moving animal. When kept as pets, they can be fed with apples, oranges, melons, dandelions, clovers, shredded carrots, worms, insets, tortoise vitamins, cuttlebone, tortoise pellets and edible flowers. There are many other things that these tortoises can be fed with. Giving them the right diet is very important because it helps to ensure that they reach maturity as fast as possible. It takes about 8 to 10 years for a yellow foot tortoise in the wild to reach maturity. Breeding of these tortoises usually start in the beginning of the rainy season (July to September). During this period, there is a general increase in activity. Males are able to identify each other by initiating a characteristic head movement. When two males meet, they will have the same head movements. When two tortoise meet and there is no head movement from the other tortoise, that serves as an indication that the other tortoise is a female. When the other tortoise is identified as female, the next step will be sniffing the cloacal region. Copulation will be the next step. During the courtship and copulation period, the males make clucking sounds with a set pattern. Rival males will fight, with the aim of overturning each other. The number of eggs in a clutch varies from 6 to 12, depending on the size of the female. It typically takes between 100 to 120 days for the eggs to hatch. Yellow footed tortoises require more room than other tortoises because of their size. You should provide a basking area because they need UV light to be able to synthesis vitamin D. However, unlike other species, they are not very fond of basking. They should be kept safe from carnivorous pets such as cats and dogs.